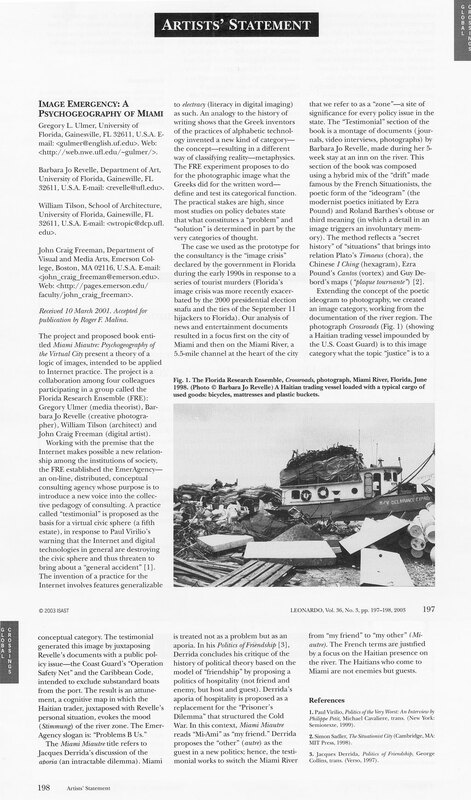 Then entire body of “Imaging Place” work includes an archive of hundreds of locations and hours of narrative. At its hight multiple scenes from this archive constructed in various locations around the Second Life grid. When a denizen of Second Life first arrives at an Imaging Place SL Scene he, she or it sees on the ground a large black and white satellite picture of the full disk of the Earth. An avatar can then walk over the Earth to a thin red line which leads to an adjacent higher level platform made of a high resolution aerial photograph of specific location from around the world. Mapped to the aerial images are networks of nodes constructed of primitive spherical geometry with panoramic photographs texture mapped to the interior. 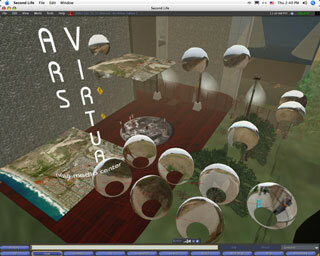 The avatar can walk to the center at one of these nodes and use a first person perspective to view the image, giving the user the sensation of being immersed in the location. 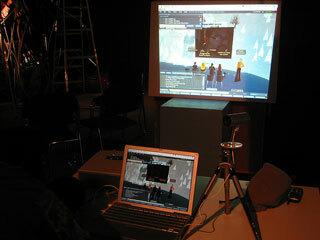 Streaming audio is localized to individual nodes providing narrative content for the scene. This content includes stories told by people who appear in the images, theory and ambient sound. 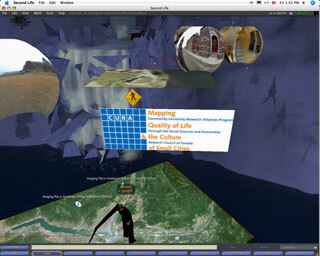 When the avatar returns to the Earth platform, several rotating enter signs provide teleports to other “Imaging Place” scenes located at other places within the world of Second Life. 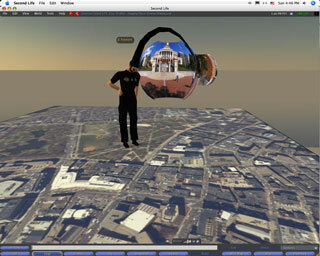 JC Fremont at work in Second Life with John Craig Freeman at work in real life. The “Imaging Place” work was conceived in the language of the network. The bandwidth issue always hampered my ability to post the work on the web and there was no good solution for populating the work with netizens. I have always aspired to make the work inhabitable. Rather than slowing my progress I continued to produce work and develop my methodology in the field. I have since amassed an enormous archive of material from around the world and Second Life is allowing me to implement the body of work onto the network where it was intended. The social component is very exciting in massively multiplayer online communities. The encounters with individuals can be of enormous significance to the development of an art practice within them. I can get instant feedback and collaborate with likeminded people. The real life version of the work served its purpose to develop a language but it is incomplete without the network. “Imaging Place” grows out of an investigation of electracy, the emergent cognitive paradigm predicted by Gregory L. Ulmer. He writes, “Many commentators have declared the need for a new logic native to new media, but few have indicated how to invent it. Heuretics (the logic of invention) provides one proven (literate) procedure for bootstrapping from one apparatus to the other. This method involves working analogically. The key analogy is with the Greek invention of metaphysics, meaning specifically (in Aristotle’s terms) the invention of a category system. Electracy needs a mode of classification that does for the digital image what the concept did for the written word (definition as a practice organizing things according to essences and accidents).” “Imaging Place SL” is an attempt to create a truly electrate form of artistic expression. Mixed Realities: The Mixed Realities exhibition, commissioned by Turbulence.org, took place at the Huret & Spector Gallery, Boston February 7 – April 15, 2008. Place Relations: The Place Relations exhibition took place at the Kunstraum Walcheturm during the Digital Art Weeks in Zurich, July 10 – 14, 2007. Floating Points 4 at Emerson Island: Emerson College and New Radio and Performing Arts, Inc. (NRPA) present OurFloatingPoints 4: Participatory Media, a speaker series that addresses the recent emergence of inexpensive, worldwide, and many-to-many publishing and communication media. Programable Media: Open Platforms for Creativity and Collaboration a symposium organized and presented by New Radio and Performing Arts, Inc. / Turbulence.org, hosted by Pace Digital Gallery, March 2, 2007. 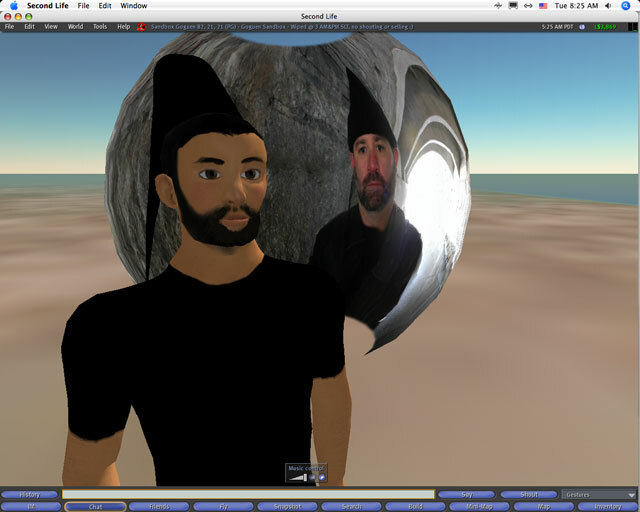 Imaging Place Second Life at NMConnect: Six theme areas over 5 sims illustrate the fundamental ideas that bind us together as networks and forces in the world. We come together around LOVE, PEACE, BEAUTY, CHAOS, TRUTH and WISDOM to explore over 50 installations from many of Second Life’s most accomplished artists. Emerson Island Second Life: Building Emerson campus in Second Life. CURA Second Life: Community-University Research Alliances Program through the Social Sciences and Humanitiess Research Council of Canada. Mapping the Quality of Life & Culture of Small Cities. Upgrade Boston Second Life: Upgrade! is an international, emerging network of autonomous nodes united by art, technology, and a commitment to bridging cultural divides. 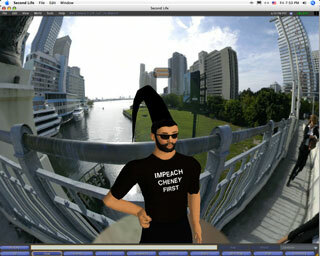 Imaging the U.S./Mexico Border at Ars Virtua: Ars Virtua is a new media center and gallery located entirely in the synthetic world of Second Life.